Control Line Airplanes Flying in "The Man from U.N.C.L.E." Melanie and I were watching an episode of The Man from U.N.C.L.E. (season 2, episode 9, "The Deadly Toys Affair") and saw a scene where boys at a school in Switzerland were flying control line airplanes. Someone on the story writing side of "The Man U.N.C.L.E." must like model airplanes because they have appeared prominently in at least two episodes. 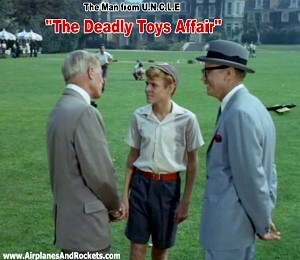 "The Deadly Toys Affair" is about a boy nuclear energy genius (Jay North - aka "Dennis the Menace") who is in target of indoctrination and recruiting by the nefarious "Thrush" crime organization. U.N.C.L.E. agents Napoleon Solo and Illya Kuryakin are tasked to rescue the boy. Good battles evil, and of course good prevails. See also "The Mad-Mad Tea Party" that featured a vintage (by now) Buccaneer B Special. Control Line Airplanes Being Flown in "The Deadly Toys Affair"